After finally choosing to view the barbaric, on-camera beheading by ISIS of freelance war correspondent James Foley, I have been left with a level of rage known only to those of us who have sacrificed unspeakable offerings on the altar of world peace. My offering was my only son — Aaron Carson Vaughn. Aaron was a member of SEAL Team VI. He was killed in action when a CH47D Chinook, carrying thirty Americans and eight Afghans was shot down in the Tangi River Valley of Afghanistan on Aug. 6, 2011. Many times over the past three years, I have been asked what drove my son to choose his particular career. What made him want to be a Navy SEAL? My answer is simple. 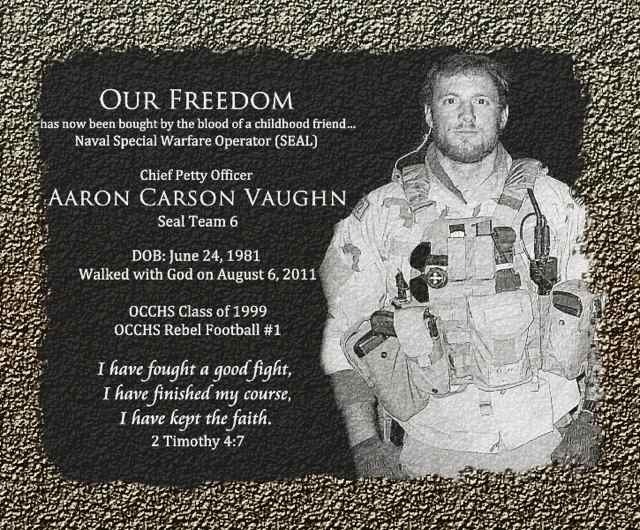 Aaron Vaughn was a man who possessed the courage to acknowledge evil. And evil, once truly acknowledged, demands response. Perhaps this is why so few are willing to look it in the eye. It is much simpler — much safer — to look the other way. That is, unless you are the leader of the Free World. As Commander-in-Chief, your actions — or lack thereof — Mr. President, cost lives. As you bumble about in your golf cart, slapping on a happy face and fist-pounding your buddies, your cowardly lack of leadership has left a gaping hole — not only in America’s security — but the security of the entire globe. Your message has come across loud and clear, sir: You are not up to this job. You know it. We know it. The world knows it. Please vacate the people’s house and allow a man or woman of courage and substance to seize the reigns of this out-of-control thug-fest and regain the balance we, America, have provided throughout our great history. Thanks to your “leadership” from whatever multi-million dollar vacation you happen to be on at any given moment, the world is in chaos. What’s been gained, you’ve lost. What’s been lost, you’ve decimated. You’ve demolished our ability to hold the trust of allies. You’ve made a mockery of the title “President.” And you’ve betrayed the nation for which my son and over 1.3 million others have sacrificed their very lives. But this should come as no surprise, since your wife uttered a vile statement on Feb. 18, 2008, during the primary campaign — one that speaks volumes of your true convictions. “For the first time in my adult life, I am really proud of my country,” she said. I am sure my deceased son thanks you for that, Mrs. Obama. Oh, and you’re welcome. Never in my lifetime have I witnessed such despair and such growing fear that the world’s last best hope, America, has finally been dismantled. Perhaps the better word is transformed — fundamentally transformed. Come to think of it, it’s become difficult — if not impossible — to believe things haven’t gone exactly as you planned, Mr. President. Amazingly, in five short years, your administration has lurched from one disaster to another. You spearheaded the ambitious rush to end the wars in both Iraq and Afghanistan — with no plan on how to do so effectively. Also, the release of “the Taliban five” in exchange for one American — without consulting Congress — is also on your shoulders. You have been at the helm during unprecedented national security leaks — including, but not limited to the outing of SEAL Team VI on the Bin laden raid, the outing of the Pakistani doctor who provided the intelligence for that raid, the outing of Afghanistan’s CIA station chief, and the outing of your personal “kill list” to make you look tough. In addition, 75 percent of American deaths in Afghanistan and 83 percent of Americans-wounded-in-action have occurred on your watch, according to icasualties.org. And now, we have this recent, heinous event: the beheading of an American citizen by a barbaric organization you foolishly referred to as “the JV team” in your statements to the New Yorker magazine in January. You, sir, are the JV team. It’s time for you to step down and allow a true leader to restore our honor and protect our sons and daughters. America has always been exceptional. And she will be again. You, Mr. President, are a bump in our road. 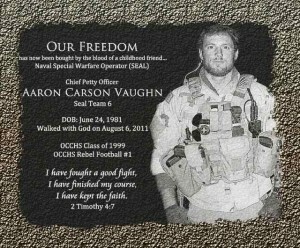 Billy & Karen Vaughn are Gold Star parents of Special Operations Chief (SEAL) Aaron Vaughn, KIA 6 Aug 2011. Billy is the author of Betrayed: The Shocking True Story of Extortion 17. Read more at http://www.forourson.us.